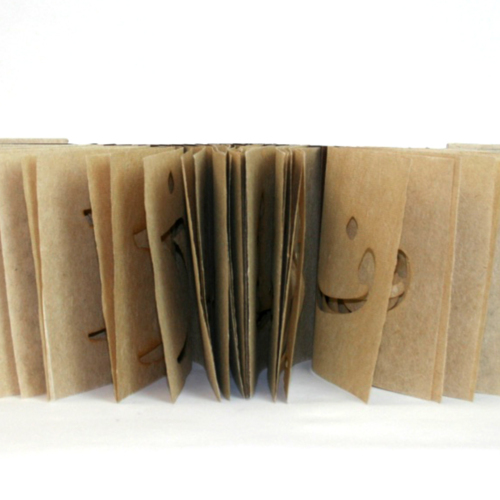 An artist's book is a work of art that takes the form of a book. But what does that mean? And what counts as a book, anyway? Is it a bunch of pages that have been bound together, or is there more to it than that? These are the kinds of questions that artists' books try to answer. They play with both the form and the function of books as objects, encouraging onlookers to question traditional conceptualizations of "books." They are usually handmade, often unique, and all different from one another. Because most artist's books are hand-made and only crafted in small, limited runs, they offer artists a special opportunity to create books that are intensely personal. In Fall 2015, the exhibit The Creative Codex: Books as Art in the Walter Havighurst Special Collections was launched. Designed and curated by Ashley Jones, Preservation Librarian, with the help of Carly Sentieri, Curator of Special Collections, the materials in the exhibit reflect a concentrated effort to build a diverse, provocative collection that will challenge students to reconsider their notion of "books" while also paying tribute to the creativity and innovation of book artists across the globe. All the artists' books in the exhibit may be found in Miami University's Walter Havighurst Special Collections. 28 folios. Laser-cut handmade flax paper. Three hole pamphlet binding in an accordion binding. Linen thread, handmade paper covers. Copyright 2015 Miami University Libraries. This site and all items herein are made available for personal, scholarly, and non-commercial purposes only. Proudly powered by Omeka.